As climate change causes shifting rain patterns and climate shocks, such as drought, people in countries that rely mainly on rain-fed agriculture are suffering increasing losses and insecurity. 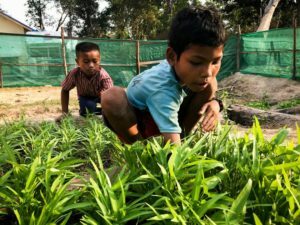 In Cambodia, a US$5 million grant from The Adaptation Fund has helped communities living in protected areas in four provinces to benefit from the more-resilient model of irrigated home gardens with diverse output, such as fruit trees, chickens, and livestock-raising and cricket farming. In community protected areas like Ngon, the projects are helping more than 6,000 people to supplement often dwindling incomes from rain-fed crops and to build sustainable local economies for generations to come. 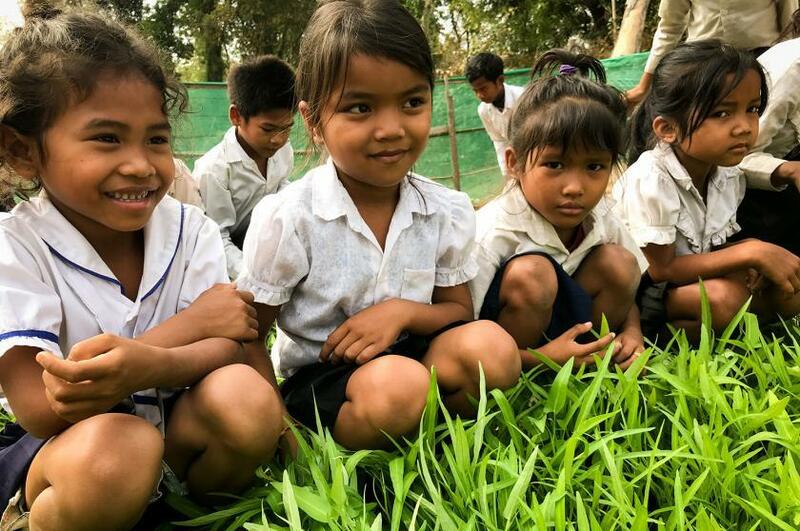 As part of a project to help people adapt to climate change, UN Environment and the Cambodian government have established school vegetable gardens, along with a water-pump for irrigation and some training for growing vegetables. There is barely a murmur from the dozens of pupils gathered in the grounds of Ngon primary school in Cambodia, even when the teachers are gone. The smallest children at the school crouch next to vegetable patches, most knee-to-knee but completely concentrated on deftly picking through leaves and shoots to pick out weeds. Older pupils carry cans of water slightly lopsided from a levered pump, but still the only real sounds are the water sloshing and the well squeaking. The relative silence is not due to the tasks being a punishment or chore, but a pleasure for many students. “I’m happy when I’m doing this and it’s now part of my day,” said 12-year-old Heng Nita. “I really love vegetables, especially fried cucumber. It’s my favourite, as well as fried spinach, and now I eat them two or three times a week and love it.” she added. As part of a project to help people adapt to climate change, UN Environment and the Cambodian government helped the school to set up a vegetable garden, provided a water pump for irrigation and some information on growing vegetables. Now, Ngon’s 200 pupils regularly spend hours in the mellow afternoon sun tending to the school’s gardens. They reap enough produce to cater for school meals and even get food to take home. Head teacher Toun Voun says there has been a marked improvement in health and wellness since the students started eating more greens. “Since we’ve had the vegetable garden, even during the seasons where people commonly get sick, there have been a lot less sicknesses and students absent,” he explained. Many pupils like Nita are relishing the opportunity as well as the outcome. “Now I have skills to grow and harvest vegetables, and I know that if you’re lazy you get nothing but if you work hard you get so much from the earth,” she said. 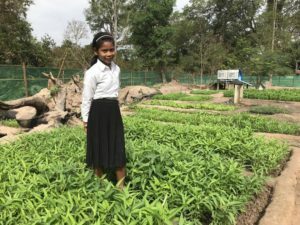 A month ago, Nita set up a garden at home with her grandmother, and she taught her the lessons from school about how to grow vegetables. Nita is now enlisting her younger siblings, so they can develop green fingers too and help her to expand the family’s vegetable patch and diet. The Adaptation Fund finances projects and programmes that help vulnerable communities in developing countries adapt to climate change. Initiatives are based on country needs, views and priorities. The Adaptation Fund was established under the Kyoto Protocol of the UN Framework Convention on Climate Change, and since 2010 has committed US$ 532 million to climate adaptation and resilience activities, including supporting 80 concrete adaptation projects. 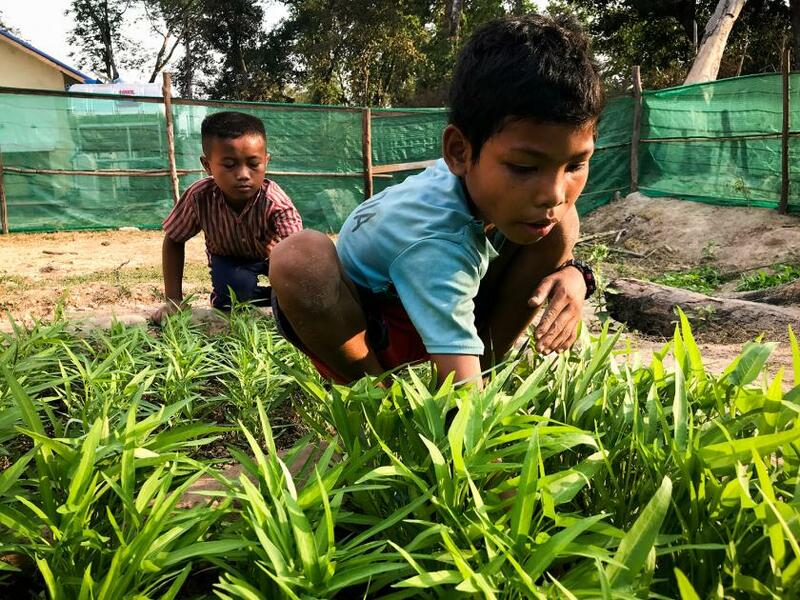 Featured photo (by UN Environment / Hannah McNeish) shows students tending a vegetable garden set up at a school where UN Environment and partners are helping people adapt to climate change and diversify their farming methods in rural Cambodia. This article originally appeared on UN Environment’s website. Reprinted here (with minor edits) by permission. See The Adaptation Fund website.